Lynne Newman plays a mix of styles, from jazz right through to current pop hits. Whether its a laid back cocktail function or an upbeat party, her unique style, combining personality with musical skills, helps to ensure a great night. 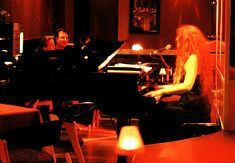 Lynne has had residencies at the following leading Sydney Piano Bar Venues: The Menzies Hotel, The Hilton Hotel, Hotel Intercontinental, Sydney Casino, South Steyne, various Travelodges, Bourbon & Beefsteak, Jacksons On George, The Albury Hotel, The Stoned Crow, Harts Pub, The Taxi Club, etc. as well as many private functions. Lynne also teaches music privately (Singing, Piano and Guitar) and ran her popular singing course "Singing For Everyone" at the University of New South Wales for 13 years.